Wow! It tastes just like eggnog! That’s what everyone says who tastes Eggnog Fudge for the first time. Truth in advertising. It really does taste just like eggnog! 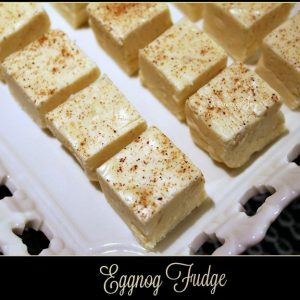 If you like the taste of nutmeg and eggnog, you’ll love this! Gather the ingredients for this before you begin. It will take a while to reach 234 degrees and you will need to stir quite frequently, but once the thermometer reaches that point things will move quickly. When you add the white chocolate chips, try to spread them around so they will melt quickly instead of dumping them all in one spot where they will clump. And take forevah to melt. Chill before cutting. 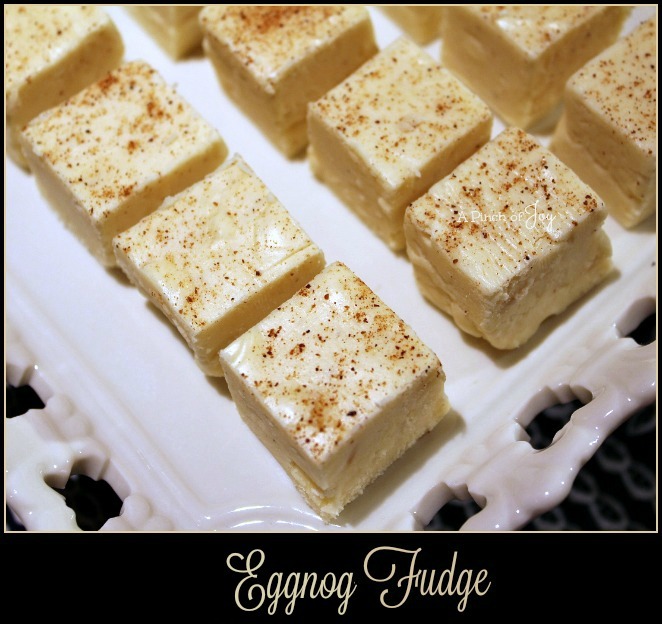 With these little hints, Eggnog Fudge goes together quickly and easily. And when you are done, it will taste just like eggnog! It tastes just like eggnog! Line a 9x9 inch square pan with non-stick aluminum foil, non stick side up, then spray with cooking spray. Combine butter, sugar, and egg nog in a large saucepan over medium heat. Bring to boil. Stir frequently until mixture reaches 234 degrees on candy thermometer. Remove from heat. Pour bag of white chocolate chips over top of the sugar mixture. Stir until chocolate chips are melted. Quickly stir in marshmallow creme, vanilla extract and nutmeg. Mix well. Transfer fudge to greased baking dish, smoothing out the top. Sprinkle with a bit of nutmeg if desired. Cool for about 2 hours in the refrigerator until firm. Lift out of pan onto cutting board and cut into squares.